How does a person or couple decide to have a baby? If you’re like most people, you might feel a little overwhelmed by the topic and think it is easier to, “Just let nature take its course.” But we interviewed one of the Nation’s leading experts on making this important decision…and that’s NOT what she recommends! The truth is you don’t have to make this decision on your own, totally alone. Join us to learn key tools to answering this age-old question on your own terms. 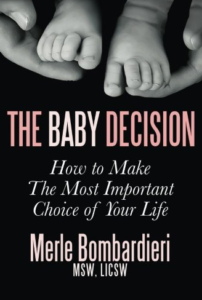 Learn why Merle Bombardieri, the author of The Baby Decision Book, believes it’s best to make a conscious decision about parenthood. Other questions we ask Merle include: How long is too long to deliberate? Should a young, working women consider getting their eggs cryogenically frozen for future use? What are some tips and exercises that Merle uses with clients to help them decide? Tune in to find out how you can win a copy of Merle’s outstanding book! Join us for part 2 – when we ask a child-free man, a mother, and a millennial about their experiences with this life-changing decision. How did they make this huge choice? What advice does Merle have for them? Tune in to find out! Merle (Malkoff) Bombardieri, is a clinical social worker/psychotherapist who specializes in parenthood decision-making, infertility, adoption, and making the most of a childfree life. Although she enjoyed raising her daughters, now grown, she has also been an advocate for childfree people since 1979. 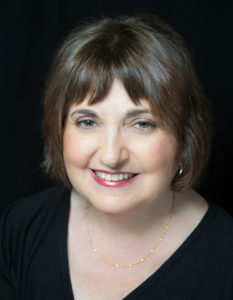 She has been in private practice for 30+ years in Lexington, MA. In 1981, she published the first edition of The Baby Decision based on interviews and reviews of scholarly research. Then in 1982 she became Clinical Director of RESOLVE, the national infertility association. There she wrote guidelines for infertility patients who were making decisions on new techniques such as in vitro fertilization and donor egg, as well as adoption and surrogacy. Around that time, she founded the support group Boston Single Mothers by Choice. This revised second edition of The Baby Decision, is based on 35 more years of work guiding decision-makers in educational workshops, long-distance coaching for people around the world and psychotherapy. Merle brings a sense of humor and compassion to her work. She helps clients and readers get curious about themselves and about making new discoveries that make life more fun. Merle’s writing has appeared in Our Bodies Ourselves, Brides, Glamour, Self, the Boston Globe Magazine, Boston Magazine and psychology blogs. She has lectured at Harvard Medical School, M.I.T., Wellesley College, and the Cambridge Center for Adult Education. She has appeared on national radio and television news shows, talk shows and documentaries, including the Leeza Show. Merle has been quoted in Time, Newsweek, the New York Times, the Boston Globe and the Huffington Post. She has also written medical journal articles and a chapter in a medical textbook. To order your copy of The Baby Decision, click here.